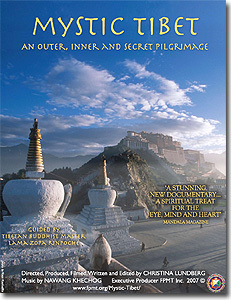 Mystic Tibet vividly captures the grandeur and mystery of this life-changing journey. One feels intimately a part of the experience, seeing these holy places and holy objects that seem to live and breathe, enduring the hardships and receiving the blessings right along with the pilgrims. This film is a visual and spiritual treat for the eye, the mind, and the heart. Its evocative soundtrack with music by Nawang Khechog and Mercedes Bahleda is as much a part of the film as the extraordinary landscapes, intricate icons, and devoted faces – not to mention the heroic Italian pilgrim who finished the journey on crutches! The DVD is now available from the FPMT Foundation Store.